Finding hidden parks and gardens is one of my favorite past times when I'm traveling. But there are plenty of out of the way greenspaces in my own backyard. I'm blogged about some of these parks and gardens before. 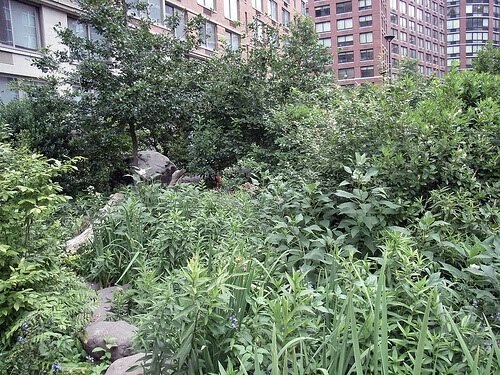 But recently I was asked to guest blog about some additional secret green New York City hideaways, in addition to elaborating on one of my favorite: GreenAcre Park that's smack in the middle of Midtown. Verdant foliage can appear in the unlikeliest of places in Manhattan, including in the atrium of a skyscraper or in the narrow alley between two brownstones. Exploring New York City slowly on foot is the way to find the attractions beyond most guidebooks. Love the idea of hideaway parks! Hi MarthaAndMe, It's always amazing how many New Yorkers have no idea about so many of these treasures that they pass every day! Thanks for the excellent post on NYC parks. My daughter works in Manhattan.I know she'll love this post. She's always looking for the green among the buildings. Hi Judy, Thanks for passing along my post to your daughter. I hope she enjoys visiting these mini oases. lovely post, Jeanine. several family members lived for a while on the Upper West side and when I'd come to visit we used to enjoy exploring for green spaces there, and exploring Riverside Park, as well. Hi Kerry, Riverside Park is a great spot all year round. Hi Sheryl, And next time you're in the city, definitely contact me. It'd be fun to hang out. I won't be in the city until next spring for ASJA. Maybe I'll have time to look around. I miss NYC. When my boys were really little, i used to meet with a friend in a very hidden area of Central Park, so isolated that it felt like we were no longer in the city. I still remember how great it was to feel like we'd discovered our own little hideaway. Hi Roxanne, It'll be great seeing you at the ASJA conference in the spring. And, if you need any other "hidden" NYC travel tips, let me know. Hi Christine, It's great that you and your sons were able to experience the hidden side of bustling NYC. Glad you enjoyed your visit. It's no hideaway, but the park behind the NYC public library near Grand Central is one of my favorites. Hi MyKidsEatSquid, Yes, that park is lovely. I visit or pass it many times each week. It's a great place to work while enjoying the sunshine. I'm always amazed how many secret patches of greenery there are even in really urban cities. I don't know New York well but in San Francisco I love the hidden garden paths at the top of Telegraph Hill. Hi Melanie, Whenever I visit San Francisco, I love checking out all the secret green spaces the city offers. I love this anywhere you go you can always find a little peace of heaven. That includes Manhattan! I cannot wait to go and explore myself.